The Year of Faith already has been a busy one for Redemptorist Father Jim Dowds, currently serving as chaplain to active-duty and retired military families on and around the Naval Air Weapons Station at China Lake, CA. It began with the celebration of the sacrament of Confirmation to 24 members of the community of Our Lady of the Desert, the parish that includes the naval station. Auxiliary Bishop Neal J. Buckon, vicar for the western region of the Archdiocese of Military Services USA, was the main celebrant. The community has also set aside time for "informal chats" every other Sunday from October through the end of the Year of Faith in November 2013. Father Dowds facilitates the time of reflection and discussion held in the evenings every first and third Sunday. Looking for a way to prepare for Sunday Mass? Need some help applying the Word of God to your daily life? Is your prayer group looking for some new inspiration? 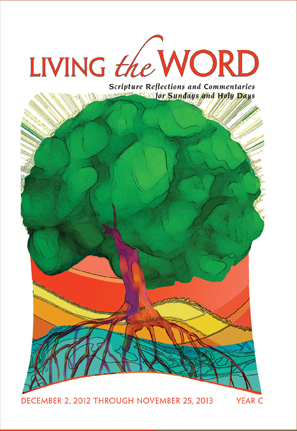 Living the Word (Year C, 2012-13) is now available for purchase through World Library Publications. Co-written by Redemptorist Father James A. Wallace and Sr. Dianne Bergant, Living the Word offers reflections and commentaries on the readings for Sundays and Holy Days for Year C of the liturgical reading cycle. This is a great resource for small groups, teen or adult religious education classes, RCIA programs, and many others. To order your copy call World Library Publicaions toll-free at 1-800-566-6150 or visit wlpmusic.com. As part of a restructuring plan, the Archdiocese of New York has reorganized its schools into three school regions, each with its own patron. The Northwest/South Bronx Region, which includes the Redemptorist-sponsored Immaculate Conception School, has been named the St. John Neumann Catholic School Region. You can read more about the reasons for the choice of John Neumann here in Catholic New York.